Stand in ovation with the Fremont Symphony! 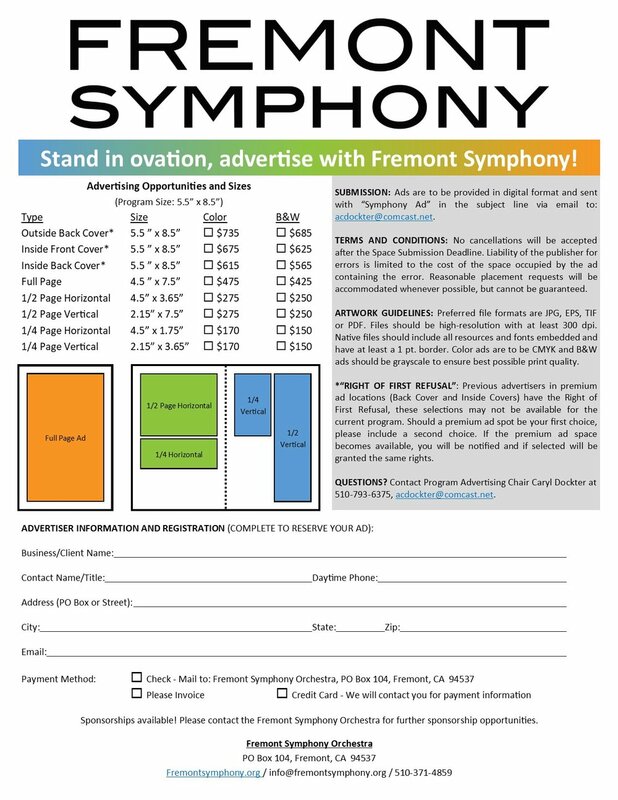 Be seen as a partner with The Fremont Symphony when you advertise in our season program. Please contact us for other advertising opportunities. Or you may complete and pay for your advertising by clicking below. Please select your ad choice. Outside Back Cover, Inside Front Cover, and Inside Back Cover spots are subject to "Right of First Refusal". See ADVERTISING DETAILS for further information. We will contact you for confirmation and payment information. Thank you for your interest in advertising with the Fremont Symphony Orchestra! We will contact you to confirm and for additional information to complete your request. SUBMISSION: Ads are to be provided in digital format and sent with “Symphony Ad” in the subject line via email to our Program Advertising Lead. TERMS AND CONDITIONS: No cancellations will be accepted after the Space Submission Deadline. Liability of the publisher for errors is limited to the cost of the space occupied by the ad containing the error. Reasonable placement requests will be accommodated whenever possible, but cannot be guaranteed. ARTWORK GUIDELINES: Preferred file formats are JPG, EPS, TIF or PDF. Files should be high-resolution with at least 300 dpi. Native files should include all resources and fonts embedded and have at least a 1 pt. border. Color ads are to be CMYK and B&W ads should be grayscale to ensure best possible print quality. Please send ads to our Program Advertising Lead with the subject line “Symphony Ad”. *“RIGHT OF FIRST REFUSAL”: Previous advertisers in premium ad locations (Back Cover and Inside Covers) have the Right of First Refusal, these selections may not be available for the current program. Should a premium ad spot be your first choice, please include a second choice. If the premium ad space becomes available, you will be notified and if selected will be granted the same rights. QUESTIONS? To contact our Program Advertising Lead, please click HERE to email or call 510-793-6375.